I don't really care to waste time on drug cheats. These people are the scourge of sport and I feel saddened that cycling has been, and still is being tainted by dishonest folks. However, I must comment on the rider formerly known as The Lion King, who I had previously been a fan of. Gazzetta dello Sport newspaper recently published details of drugs and practices employed by Mario Cipollini who is alleged to have been a client of the notorious Dr Eufemiano Fuentes. According to sources, Mr Cipollini is alleged to have paid the doctor for his "doping services" using the pseudonym "Maria", between 2001 and 2004. This could therefore throw into doubt his 2002 World Championship title, his Milan-San Remo win of the same year, as well as numerous victories at the Giro d'Italia and the Tour of Spain. All this has yet to be proven, and is under investigation by the Italian anti-doping agencies. 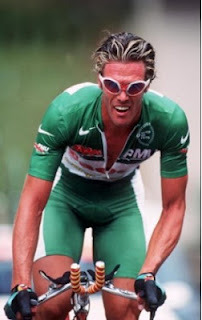 If these facts, which Cipollini strongly denies, do prove to be true, then once again we will have to deal with yet another fall from grace of a deceitful athlete. Someone who many admired has conned us and furtively stolen from others the chance of genuine glory. He has robbed prize money and sponsorship by stealth from all those who work for the good of promoting cycle sport. That disgusts me.